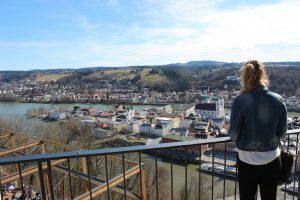 To get up here you can take the car, the tourist bus (which starts in front of the town hall) or you go by foot. 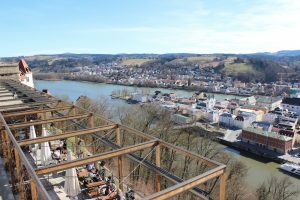 Up there you can visit the museum or just enjoy some drinks and a typical bavarian meal at the panorama terrace. The food is amazing and it even tastes better with this great view! 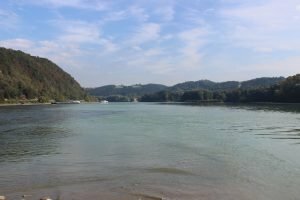 At the very end of Passau you’ll find a beautiful park and the spot where all three rivers flow together. It’s an idyllic place which is perfect for a little break. I often come here to read a book, enjoy the sun or just have a chat with a good friend. 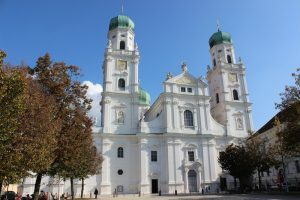 Passau’s landmark is the St. Stephan’s Cathedral. 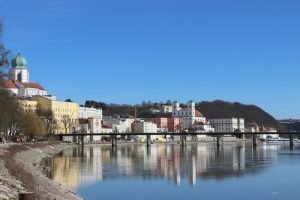 The white building with its green domes can be seen wherever you stand in Passau. The architecture is stunning and especially the white, shining colour makes this cathedral so special. 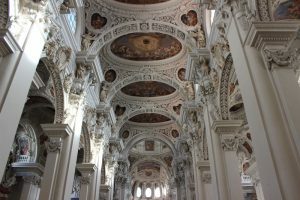 You shouldn’t miss going inside as the paintings and decorations are just beautiful. I really like the bright colours. The organ is fascinating as it is the world’s largest organ of a cathedral. 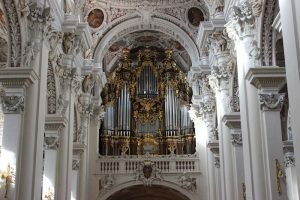 There are short organ concerts (30 minutes) that offer visitors the chance to experience this instrument live. I’ve been to such a concert and I was really impressed. It’s definitely worth going. If you’re interested in the history of the cathedral you can join a guided tour which is definitely recommendable. 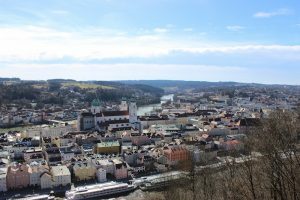 Passau’s heart is the old town. 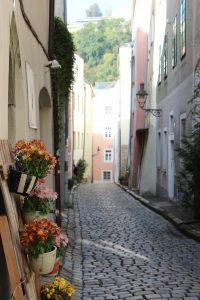 There are so many beautiful streets and alleys which are perfect for a stroll and some shopping. There are the typical stores (especially in the shopping center called Stadtgalerie) but also very individual shops. I love all those cute shops where you can buy great gifts, decorations or books. 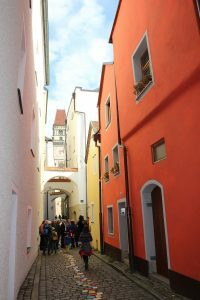 An insider tip is the “Flämisches Schokoladenhaus” which can be found in the Grabengasse. Here you’ll find amazing chocolate creations which are all hand-made by the Belgian chocolatier Patrick De Clerck. I just love his chocolates! 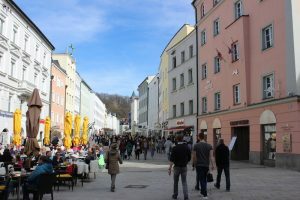 Besides, you find heaps of cafés, restaurants and bars in the old city center of Passau which are great for a break. 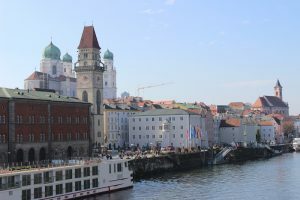 Passau is surrounded by water which is why you should definitely take a boat ride. 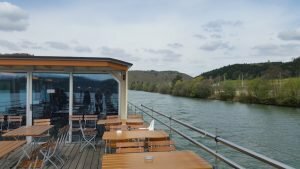 There are cruise ships that take you to Vienna or even further, but there are also boat tours that only take a couple of hours. 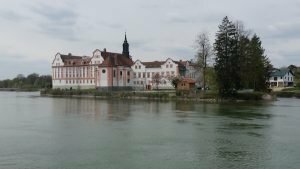 I especially enjoyed the trip on the Inn from Schärding (Austria) to Passau and back. It takes 2 hours and you see the great landscape that surrounds the river. 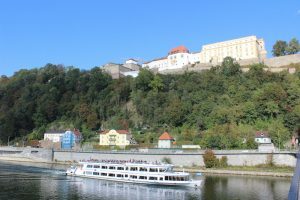 However, there are many more boat trips with different durations. To see them all click HERE. 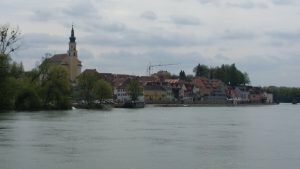 The cute village Schärding in Austria. The waterside of the Inn is really beautiful with its planted parks. It’s great for a stroll or just a break from the sightseeing tour.